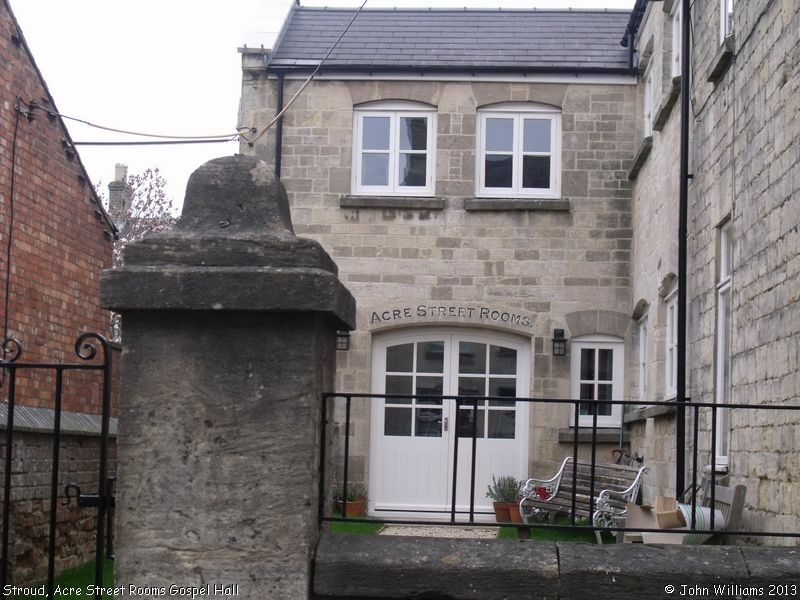 Plymouth Brethren have been meeting in Stroud since 1852, and "Acre Street Rooms, Gospel Hall" was said to have been their meeting place in 1999, according to notes on <Stroud Genealogy on Stuart Flight's "Glosgen" website. The address is still registered as a place of worship on the Find-a-Church website in the present day, though it is not clear whether this is still for the Plymouth Brethren. "Acre Street Meeting House" is listed in Places recorded by the Registrar General under the provisions of the Places of Worship Registration Act 1855 (2010) with a congregation of "Christians or Open Brethren", so the answer is probably yes. Acre Street Rooms Gospel Hall, Stroud shown on a Google Map. Information last updated on 16 Nov 2018 at 14:12. Please also remember that whilst the above account may suggest that Acre Street Rooms Gospel Hall remains open and accessible, this may not remain so. This Report was created 29 Mar 2019 - 00:25:23 GMT from information held in the Gloucestershire section of the Places of Worship Database. This was last updated on 7 Feb 2019 at 07:45.